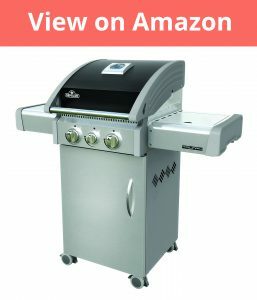 If you are looking for a serious grill you have likely heard about Napoleon, if not they are a manufacturer that is known to make some very nice quality grills usually with a generally good reputation. But can this Triumph 325 really stay in line with this standard. Lets find out! Let me start of by talking about design. The unit itself is primarily made from stainless steel, this gives it a more premium looks and appearance that I really like. Though it isn’t the flashiest of grills I have seen it definitely has a nice premium look and design. As you can see from the picture this grill has a cooking lid which allows for cooking at extremely high temperatures. You can also monitor the temperature with the built-in thermometer right in the lid itself which is a handy addition. On the sides you have the shelves which are useful for food preparation or whatever you need them for. They can also be folded down if you are grilling in a smaller space or if you are storing the grill which is nice. Also on the underside of the grill you have wheels with clamps which allow you to move around the grill as you need to. Under the grill itself you have the cabinet for your propane tank, though while I personally used the propane option there is also the option for natural gas. The grill itself has 3 burners which have the heating power of 34,200 BTUs. In real terms this means it’s easy for the grill to get over 600F in a matter in minutes. The cooking grids are made from cast iron which is much better at holding the heat than other alternatives – this also makes for searing a breeze and you always get nice sear marks. The heat is well spread out and there aren’t any areas which get much hotter than others. On the right hand shelve there is an integrated side burner for using a traditional pot or pan for heating condiments or whatever you prefer. The side burner can also be covered when not in use if you just want to use it for the additional shelving area. In terms of set up this isn’t the easiest grill nor is it the hardest. It took me about 2 hours to get it built and set up properly – the instructions where easy to follow and it really is quite practical for almost anyone to build. One final thing I would like to mention is the grease tray. It is big and can be covered with a foil before usage which when you are done cooking can then be removed and this keeps the tray protected and makes for easy cleaning. Overall this Triumph 325 Grill does everything you would expect from a higher end grill and has all the quality that will undoubtedly last for years and years to come. I highly recommend it!